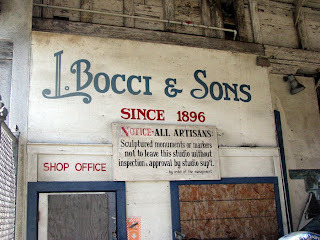 Today Steve and I are going to Charleston for the Piccolo Spoleto juried art show. In Box XL received an honorable mention! I'm thrilled, of course....but not as thrilled as I am about my Decision Portrait Series! This week I finished two more: Living with HIV and Pro Choice. I also took photos and got signed model releases for: Patroit and Muslim. All of these are powerful decisions. 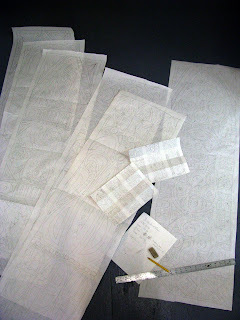 After I finish each piece, I send a photo and the "rough draft" of the blog post to the "model". This allows each participant the opportunity to add or change comments. This is also the time I ask whether their name and/or link can be included.....so....check back! I'll be posting again soon! Earlier this week I finished a portrait called Vintage Clothing Vendor (scroll down to view). I loved picking out all the colorful buttons that suggested a wide array of outfits from different decades. It was a perfect depiction of an everyday decision. Cheri Alexander makes this decision on most days too. She has a professional job and a corresponding wardrobe. Yet, she doesn't always have to make such a selection. Cheri has another option; she's a nudist...for over forty years! In fact, Cheri is a member of several nudist organizations, even served on regional and national levels. She is the founder and owner of Travelites, a local nudist club. When approaching this portrait, I only had to think for a few second before knowing the best way to embellish an image that speaks of an unadorned body. I picked natural stained wooden beads and the simplest decorations. I kept the colors to a "bare" minimum....blond, like Cheri....and gray, like the xylene transfer. I'm pleased with the straight forward results....they, too, are very much like Cheri! 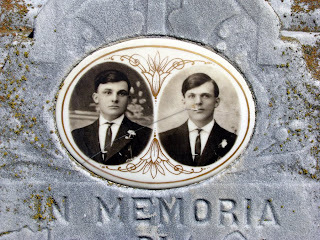 Looking back, cemeteries have always been a fascination. 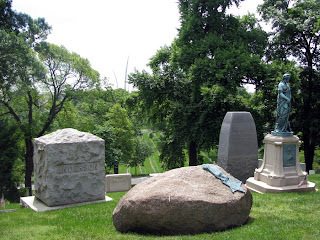 Chiseled gravestones, flags and flowers, and a place for remembrances have always been important to me. 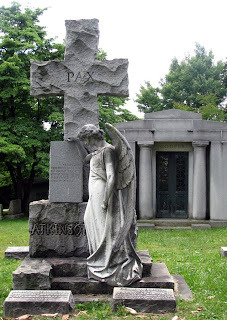 Now, however, I'm deeply involved in an art series using grave rubbings, epitaphs, and photos from these sacred places. It just happened to be Memorial Day weekend when this creative adventure took us to our nation's capital. 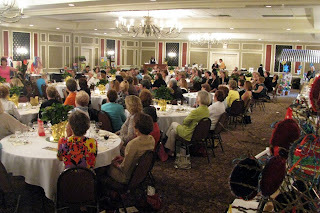 We actually planned the trip in order to attend a Thursday night book auction and did manage to purchase two shelf lots of gardening books....at a great deal too! So, on Friday I ended up at Arlington National cemetery....walking in behind a large group of Harley riders all wearing jackets with their former Vietnam ranks and other insignia. Numerous school groups nodded and whispered "thank you" to them. It was nice to see the respect. 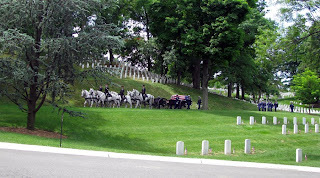 It was a special weekend and there were several funerals taking place. Quickly I wandered off by myself....barefoot. It just seemed right. 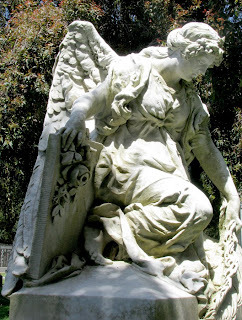 This is often how I walk through cemeteries. I've had some comments/emails about "respect" with regards to grave rubbings. Please note, I don't use any of the names; I pick up litter as I go; I pray; I step quietly and barefoot...though, yes, upon the grave site. This artistic work is being made and collected with my utmost respect. Later in the day Steve and I went to the National Gallery of Art (East building) to see an incredible exhibition of Medieval illuminated manuscripts called "Heaven on Earth". My university degree isn't in studio art but in Medieval and Renaissance Studies. I love these rare images, the texture of vellum, the symbolism, the brilliant colors and gilding, and the attention to the most minute detail. From there, we went to the National Gallery of Women in the Arts to see the Hungarian Women's Photography exhibit, which didn't blow us away at all.....but Mary McFadden's Goddesses was absolutely stunning. I generally don't "go" for fashion shows....but the historic inspiration and the beading were awesome. McFadden's haute couture designs were shown alongside her personal, historic textiles and jewelry. I found myself scribbling down ideas for sequins. The video interview was very, very good too! Our final destination was the Smithsonian American Art Museum and Portrait Gallery to see Jean Shin's Common Thread. 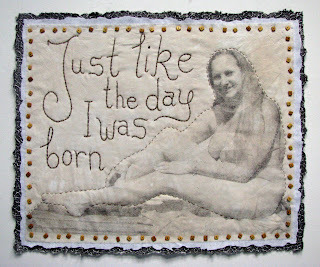 I've seen several articles about this Korean-born/American installation artist....Fiberarts and Crafts Magazine. The show lived up to and beyond my wildest dreams. Jean Shin's work can be enjoyed on any and every level. Each piece was both serious and amusing; easy to comprehend while also being deeply profound; well crafted and included sensible statements....as opposed to high-brow "art speak" addressing only the culturally elite. 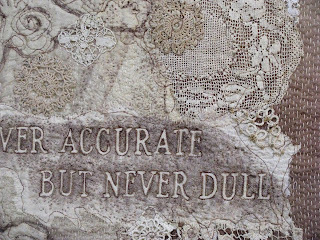 I admire her labor-intensive processes....something every embroiderer understands very, very well! 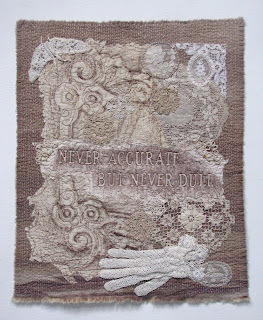 All I wanted to do after viewing this exhibition was to STITCH! So, I stitched! 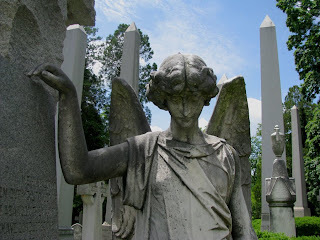 Of course, I stitched in the car....on the way to DC and then on the way to Richmond, Virginia where we visited Hollywood Cemetery, another spiritual place of great beauty and lots of angel sculptures. 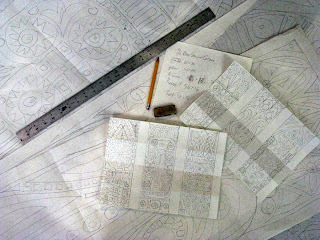 I gathered more epitaphs and did several rubbings. 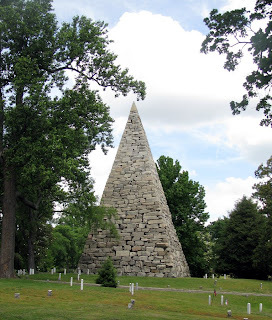 It was another fitting place for Memorial Day, especially around the stone pyramid that is the Confederate Memorial. This one is called....obviously....Never Accurate But Never Dull (above). While this isn't the sort of thing I might want left said of my life, the words spoke volumes to me. These appeared to be words left by a husband for his cherished wife. 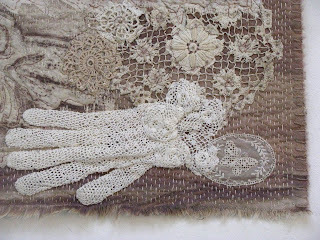 The vintage lace and crocheted glove just seemed perfect for it. Once home, I received a telephone call from the parents of a young Marine who was killed in 2005. I contacted them for my Decision Portrait Series. We met yesterday....to sign the standard Model's release and scan the military photo. I can think of no better way to spend Memorial Day than working on this future piece. 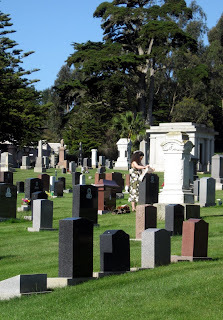 This grave rubbing was done from three different stones in the Presidio Military Cemetery in San Francisco. 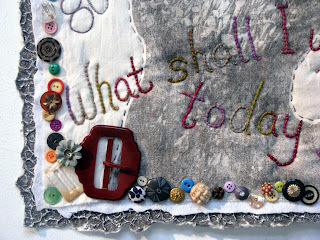 It is only the second piece in the series that isn't a collage; it's a "whole quilt"....I think(?) I've really only been quilting since last fall and am not sure about all the proper vocabulary. Whatever it is....there's only one piece of material making up the top layer. I didn't actually "plan" the design; I just liked how these rubbings looked without snipping them apart first. When I put the antique lace in place, I knew my design was complete. For some reason, I didn't do a lot of handwork on this small art quilt. I don't think it needed it. Steve and I just decided to head to Washington, DC this weekend. There's an antiquarian print auction to attend, museums to visit, and plenty of time to stitch in the car! Oh...I forgot to mention that one of my "In Box" series pieces was accepted into the Piccolo Spoleto juried show in Charleston....so if anyone is going for the annual Spoleto Festival, check it out....in the city's Visitor Center. Last week was almost a blur! 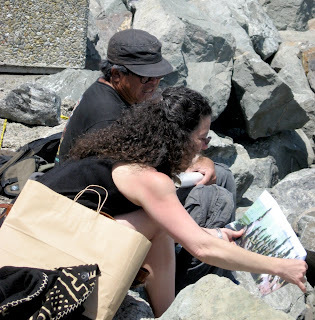 Getting all the images, thoughts, and ideas written down and organized from our trip to Colma and San Francisco was quite a task but there were other things to do! 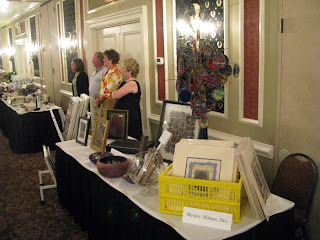 Last Thursday night I participated in an evening of art and comedy benefiting Ovarian Cancer research. 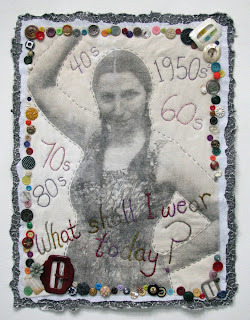 This is a cause that is near and dear to me....ever since the Decision Portrait I stitched of Linda Lynch. Happily, I sold quite a few items and thus made a nice percentage for the organization! 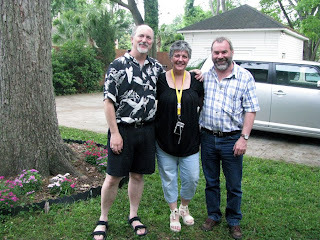 The next evening my sister Wanda and her new husband Reinhard came for a whirlwind, 24-hour visit. They live in Munich, Germany and were trying to visit as many stateside family members as possible during two-weeks of driving through Pennsylvania...to Niagara Falls...on to West Virginia...further to us in South Carolina...and back again. They'll need a vacation to recover from this trip! With all this going on, I still found time to work on art and embroidery. In fact, I've accomplished several things. 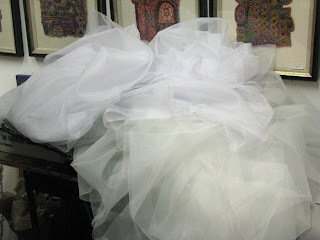 First, I bought and ripped into 18" strips dozens of yards of three different, very sheer colors of chiffon. Some are ten and eleven feet in length. Some are only six feet long. Measurements, diagrams, and lists were also created. This will be my hanging installation of epitaphs. The first few are already stitched....free motion machine embroidery using a water soluble, adhesive stabilizer. To see the "test" pieces, click here. Of course, I need another series like a "whole in the head".....because I'm still working on the Decision Portraits! 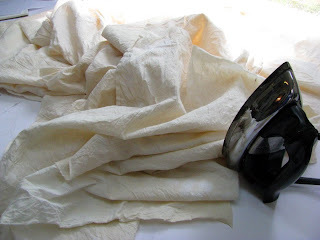 Temporarily, however, I was out of tea-stained muslin. Today, however, six yards were purchased, pre-washed, tea-dyed, dried, cut into 22" strips, and ironed. 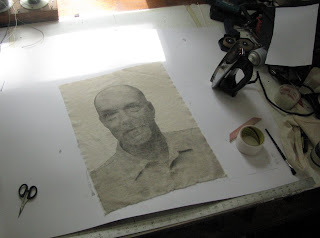 Four new portraits underwent the xylene transfers and were started including the one below. The upcoming titles are: Pro Choice, Living with HIV, Nudist, and Vintage Clothing Vendor! 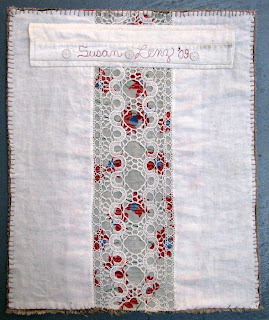 In the evenings, I'm still hand stitching and will likely have the next, small Grave Rubbing Quilt ready and photographed within a day or so. 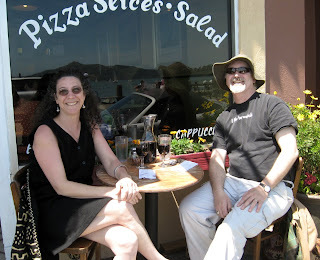 While Wanda was visiting, we talked about blogging, art, and life. It was the first time she'd ever seen most of my work, my studio, and even the house since the fire almost six years ago! One of the things we discussed was the fact that I don't read as many blogs as I used to. It does sadden me. I do miss so many things and work by such special, cyber friends. Please forgive me if I haven't read in months but know that I am working. At the end of last month, April 28, I passed the three year mark of blogging. (I had an "old blog" before this one!) I love blogging. It has been so influentail in my life and art. Time, however......well.....there's just not enough to it! 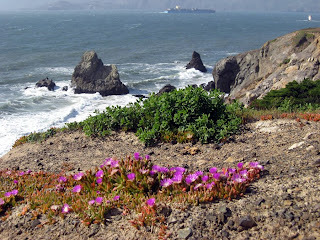 A week behind...Colma and San Francisco! 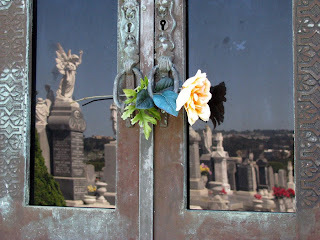 Steve and I took over eight hundred images during last weekend's trip to San Francisco and Colma, City of the Dead. During this past week we deleted, sorted, named, and organized them. So....in a nutshell.....here's our trip! 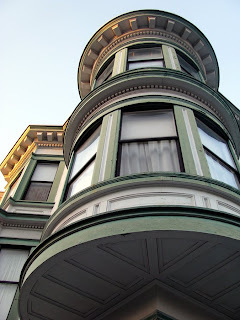 We flew west on Thursday, May 7 and had plenty of time to find The Mosser Hotel just off Market Street where we booked a tiny double with shared bath accommodations....just like traveling in Europe in the 60s and 70s and at a price of only $55 per night. The location couldn't have been better! That first evening we walked all the way to Fisherman's Wharf admiring architecture, steep hills, multi-lingual signs, Chinatown, crabs ready to be boiled, a sunset on Alcatraz, and picking out a fabulous restaurant in the Italian section of town with a red-and-white checkered tablecloth on an outdoor table. 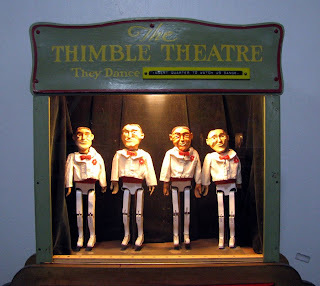 We also wandered into a large collection of antique arcade machines that were sort of creepy and nostalgic all at once. and the "art reason" for the entire trip! ...who have decades upon decades of experience....and car dealerships! (We have no idea why!) Steve and I never had lunch. There was no place within walking distance to grab a bite to eat! 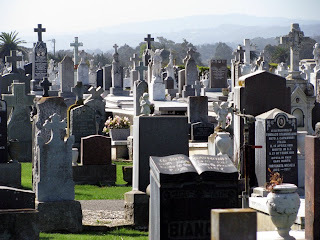 Colma was more than I expected....there's no way to explain just how many tombstones, epitaphs, mausoleums, and columbariums there are in this suburban town. 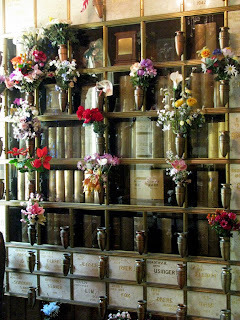 San Francisco outlawed burials within the city limits after the Great Earthquake in 1906. 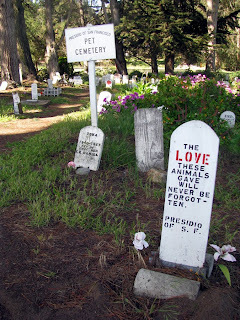 By the 1920s almost all existing cemeteries were physically moved to Colma. 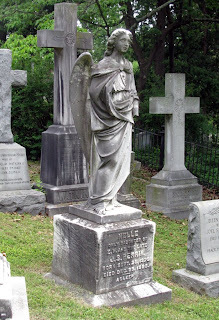 It had its own railroad station for this gigantic relocation of graves. I could have spent weeks wandering, collecting grave rubbings (crayon on silk or polyester lining), and writing down interesting words. 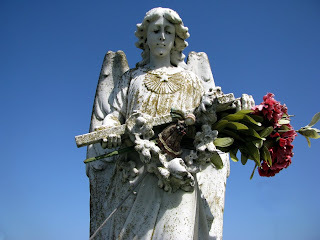 I took hundreds of photos, especially of angel sculptures. 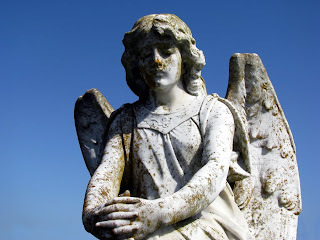 In addition to taking photos of angels, I aimed my camera at all sorts of details....like the porcelain portraits on many of the tombstones. 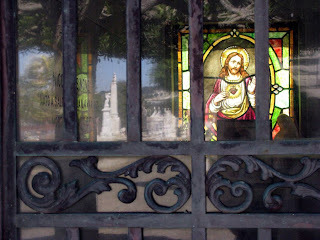 The reflections of the cemetery itself in the glass mausoleum doors were amazing as well the many stained glass windows inside these solemn structures. 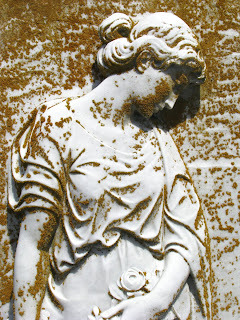 The bas relief sculptures mingled with the lichen and other signs of passing time. 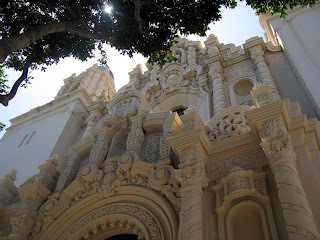 The entire place was peaceful, serene, and filled with inspiration. 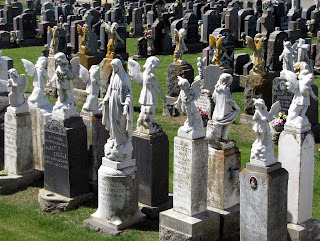 I wrote down dozens upon dozens of touching epitaphs....some in foreign languages....some in special symbols. 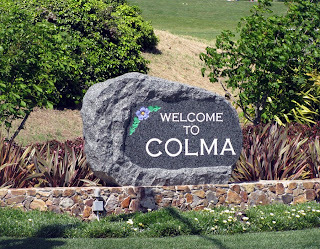 I didn't have enough time in Colma. Before leaving, I wanted to return! 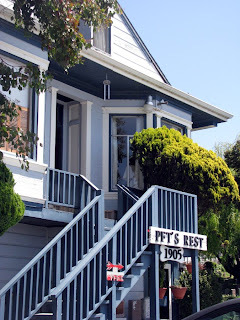 Pet's Rest is also located in Colma and it was unique. 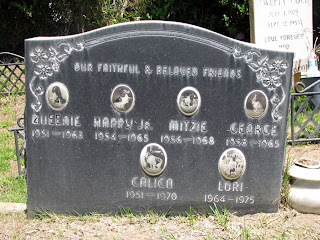 We'd never been to a pet cemetery before. 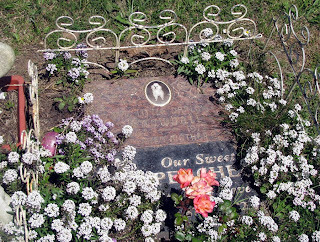 The words for departed dogs and cats were as touching as those for beloved human family members. 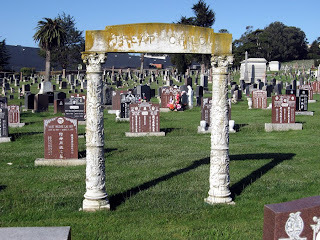 We spent so much time in Colma that I was sunburned. Between cemeteries, we dropped into the Town Hall where the two nicest young ladies (Christina Acosta and Kristina Krow....THANK YOU! Truly ambassadors for your town!) gave us additional information, bus schedules, fruit bars, bottled water and souvenirs! 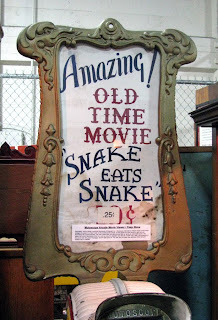 They sent us on to the Historical Society to meet truly informed experts in local history....where we bought T-shirts and looked at a collection that included the town's first computer as well as vintage funeraral jewelry made of human hair and an excellent research library. That night we had a great dinner at Annabelle's, a "green restaurant" specializing in organic dishes and went to see San Francisco Ballet's contemporary triple bill performance. It was a grand day. On Saturday we rode the Powell Street Cable car....hanging on for dear life...trying to capture the experience on video mode....laughing the entire way...to Fisherman's Wharf and then went on to three of the only cemeteries within San Francisco itself. 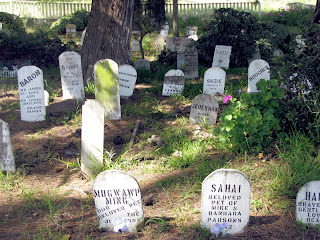 The first place was the Presidio's Pet Cemetery. 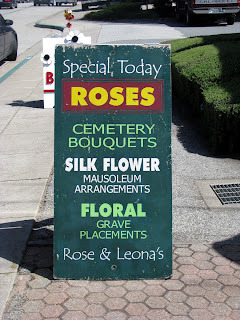 Started by military families living in the area, it was a charming place of mostly homemade markers and plenty of blossoming bushes. 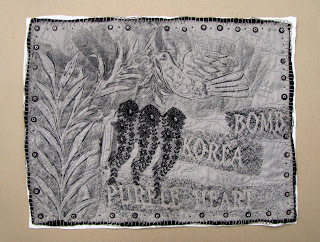 It was a short distance to the military cemetery where I got a few great rubbings that have already been basted into at least one future grave rubbing quilt....a dove of peace with the words "Purple Heart", "Korea" and "Bomb". 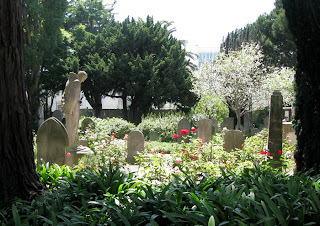 The last cemetery we visited was in the churchyard of Mission Dolores. 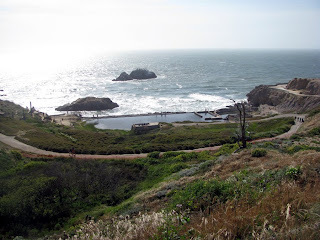 We admired the church, the cathedral and the graves before going on to the Sutro Baths. 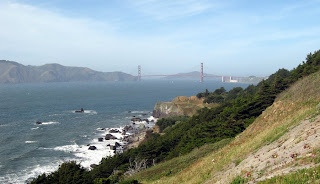 As the sun began to set, we hiked along the Coastal Trail with great views of the Golden Gate Bridge, the pounding surf, the rocky shoreline, and the colorful foliage. By the time we returned to our room, we were too tired to venture out....but we bought great Californian red wine and cheese on the way for dinner! Sunday was our final day in the city. 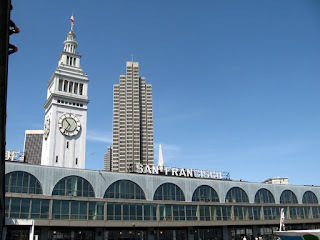 We stored our luggage behind the front desk and went to the Ferry Station for the first boat to Sausolito. 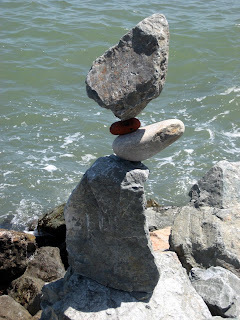 Lunch was at a pizza joint overlooking the bay....where we found Bill Dan creating his famous balancing rock cairns. Immediately, I was in a deep and interesting conversation was art, life, and a creative lifestyle....Steve paid the lunch bill and took the photos later! 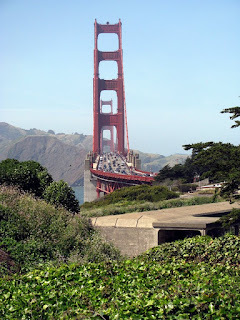 We returned to San Francisco via the bus to the Golden Gate toll booth area....for more hiking along the coastal trail.....and another amazing bus ride across the hilly cityscape. 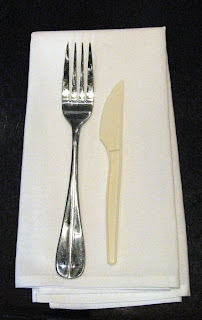 After collecting our suitcase, we took the BART back to the airport where we had dinner...using airport utensils. It was an amazing trip....totally inspirational....completely non-stop activities...and the weather was GORGEOUS the entire time!